Over the past couple of weeks, a lot of sites have been talking about the redesign of Merida, which was done in order to 'welcome' her into the Disney Princesses franchise as the eleventh member. She's now alongside 'classics' like Snow White and Cindypants, as well as more recent characters like Mulan, Rapunzel and Tiana. And, well, this whole debate has driven me absolutely batty. 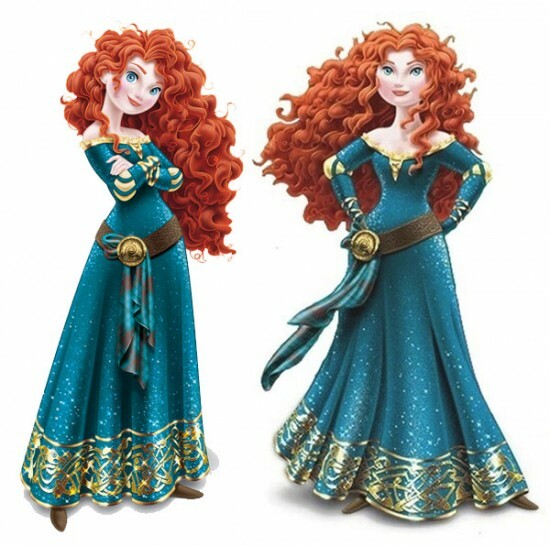 The new design caused a lot of sparks to fly because Merida's figure had been changed to something more conventionally attractive (wide hips, small waist), her dress had become even tighter(!) fitting, more low cut and quite sparkly. I did notice that they've kept the split elbows from the film, however, which is very much a good thing, and I have seen notions that her Princesses dress is based off the one she wears at the end of the film. In terms of going against that - it's clearly not her 'daytime' dress (something most of the other princesses share as a theme), so it would obviously be more elaborate. We also see in the film itself that she wears a corset, which goes some of the way to explaining her figure. The final piece of the puzzle was an image of Merida in a slightly seductive pose, looking over her shoulder. Whilst I agree with a number of the arguments against it (e.g. the 'slimming' of her figure), I think you have to bear in mind that the Princesses line is *highly* stylised, and both Merida and Rapunzel (who is never mentioned in this respect) had to be changed from 3D animation to 2D. This on its own would need to bring changes in order to allow Merida to seamlessly fit in with the visual look. As it stands after the 'reversion' of her design, she sticks out like a sore thumb. I don't agree that her hips needed widening or her waist thinning, I think those two aspects were certainly unnecessary, though it may be worth mentioning she still manages to have one of the widest waists of the group. And this is why I find this argument to be very insular and problematic, as it doesn't actually address the issues at play. Merida's redesign is not the issue here *at all*. It's actually one of the least problematic designs in the range! Have a look at, say, Rapunzel. It looks like she would snap at the waist in a light breeze - Jasmine is no different in this respect, either. How about Snow White's expression, often drawn with a slightly coy "come hither" vibe? SHE'S FOURTEEN. Truth be told, most of those expressions are quite worrying when you really think about them. 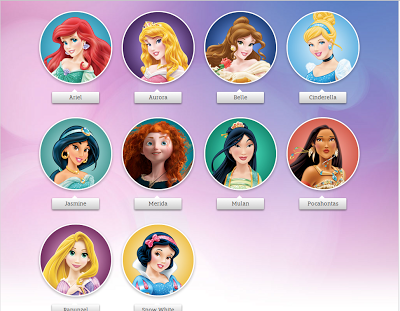 Disney Princesses: Flowery are our names, seduction's one of our games. To put it another way, it feels like attention has been placed on a minor issue within the larger picture. This backlash shouldn't just be about the way Merida was redesigned, it should be about what Disney have done with the franchise as a whole. It should be about how the range sexualises a whole range of characters, teen or otherwise. It should be about how they are focused with pushing these same few ideals over and over again - something Brave was heavily praised for going against. Even Mulan and Tiana (The Princess & the Frog) were both films (well, counting Mulan 1+2 as a single film here, as they really should be) that subverted the typical messages that girls are shown every day. See, I do think there's a good counter argument against Merida's redesign. She is one of the least sexualised characters within that range, and this was something that should not have been ignored with Merida. A major aspect of her story was about how she wished to live her own life at her own speed, and not be forced into anything she didn't want. She wasn't interested in a romantic partner and she was even willing to go against the traditions of her culture in order to remain a free spirit. But, you know, I think there's a ray of light that is managing to get through some of the thick clouds surrounding this issue. If this range gets more kids watching Brave, Mulan, The Princess & the Frog, then we have to take that as a victory. Whilst the messages are occasionally handled in a hamfisted manner (e.g. Mulan's relationship), they show kids that being true to yourself is more important than what others think, but that you also have to make it happen for yourself. Tiana's struggle at the start of her film is, to me, one of the best messages I have seen in a film of its type. She's not just wishing on a star, she's working to make her dream happen. And those kinds of messages are very important. To summarise; I do see the issues with the redesign. But I don't see them as being issues that only apply to Merida, and to single her out is to do her and the idea behind it a disservice. We should be looking at the whole range and how those characters are depicted and marketed. Snow White's coyness, the neglect of Tangled's story for Rapunzel. We should not be ignoring Merida, no, but we should not be focusing our efforts on her, because her design is a small piece in a much wider, more problematic system. Getting Disney to revert Merida's design changes nothing in the grand scheme of things. It is a hollow victory, because the wider issue has not even been touched upon. And yes, I do actually like her 2D design.